Good: Very distinct and unique art style. Bad: Some repetitive gameplay elements. By the developers of Stories: The Path of Destinies, and taking place in the very same fictional universe, Omensight is a new action role-playing game hitting digital stores on PC and PS4. In a unique blend of Animal Farm meets Bastion meets Groundhog Day, the game places the face of the world known as “Urralia” in your hands. Earn the trust of a colourful cast of anthropomorphized animals to solve the whodunit that holds the key to saving the world. The God-less Priestess has been murdered. In the wake of her death Voden, a massive snake who is destruction incarnate, has risen from his slumber to devour all of Urralia. As prophesied, the Harbinger awakens to prevent this end of the world. You take control of the Harbinger at the dawn of the last day, before Voden consumes all at sunset. Meeting a colourful cast of characters along the way, the Harbinger continuously goes through the world’s final day, collecting more and more pieces of the puzzle as she goes. The world still ends, but then you get to go through that final day over and over again. The end goal is to prevent the apocalypse at Voden’s hands, and indirectly to figure out what exactly prompted his return to Urralia in the first place. The cast’s back stories come together in the meanwhile. 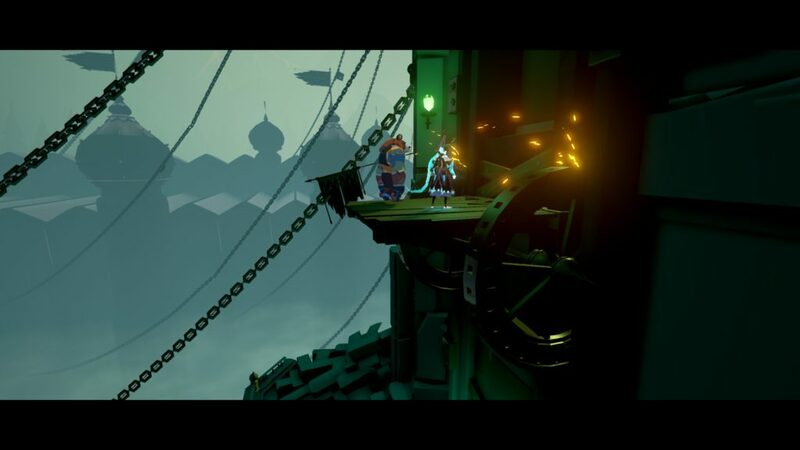 Littered all throughout Omensight are pieces of orchestral music that attempt to capture the action, as well as even an incredibly moving acoustic song, sung by the character Ratika when you first attempt to reach out to her. Every single character is voice acted in the game, except for the Harbinger, as she is a mute protagonist. The voice acting is great, but other than Ratika’s song the rest of the soundtrack is pretty forgettable. 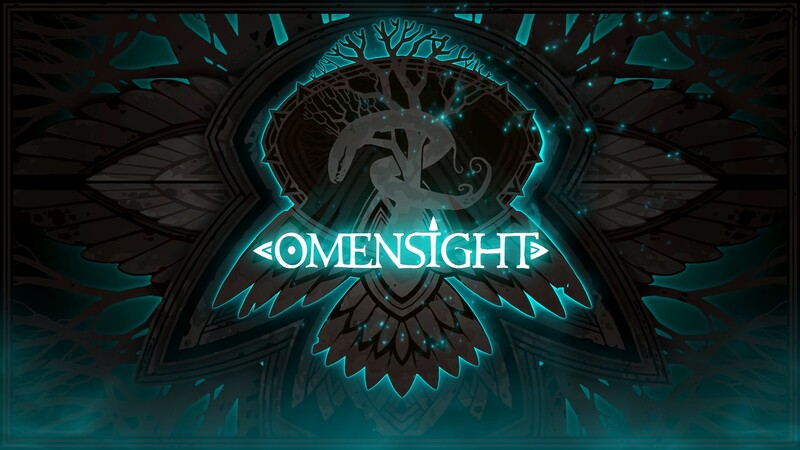 In terms of sound Omensight gets a passing grade but it’s not what it will be remembered for. 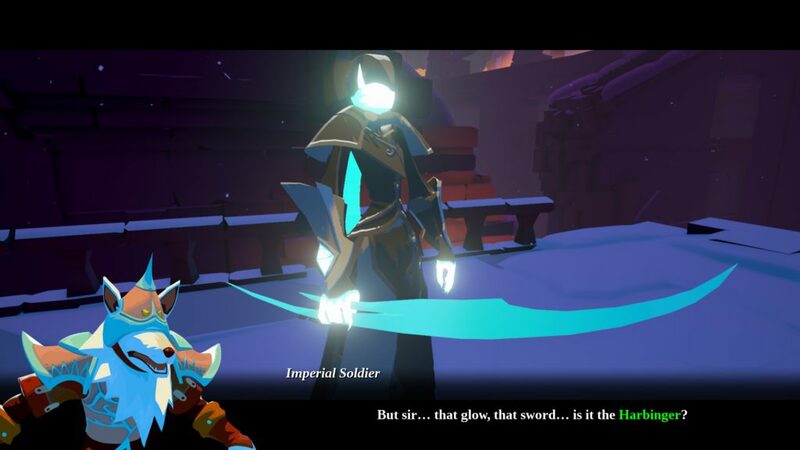 Omensight features a unique blend of elements from platformers, action-adventure games, and RPGs. The game has you replay through the world’s final day over and over until you find the solution. You replay the day by choosing one of four characters’ souls to link up with, and you’ll then team up with them for the rest of the day. Progressing through the levels is very self-evident. They are linear, with the next areas being opened up to you as you pull the corresponding levers or clear all enemies. 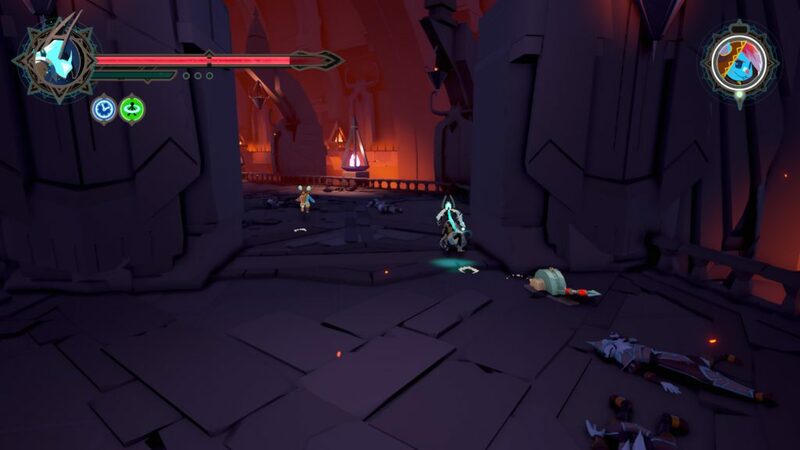 The combat is very snappy and feels like the love child of Arkham-style combat and God of War hack-and-slash. You mash light attacks for combos, use heavy attacks to break through blocking enemies, and you can at any time cancel any action into a dodge. As you level up and amass points, more powers and upgrades are made available to help spruce up this action. 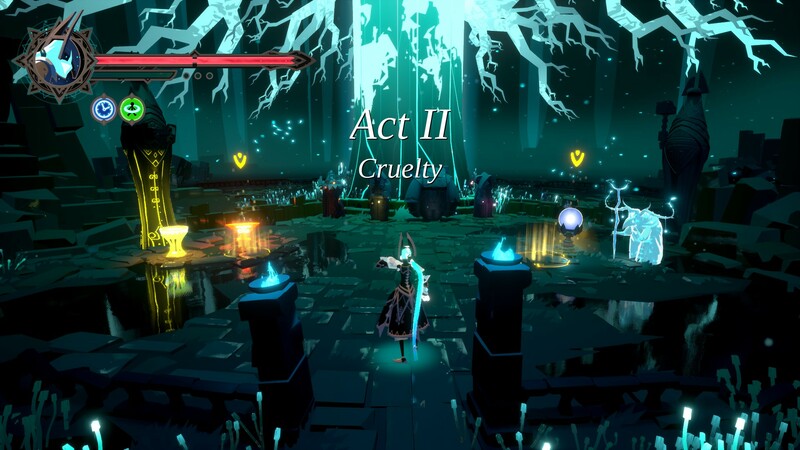 However, this is where we run into Omensight’s glaring weakness: repetition. 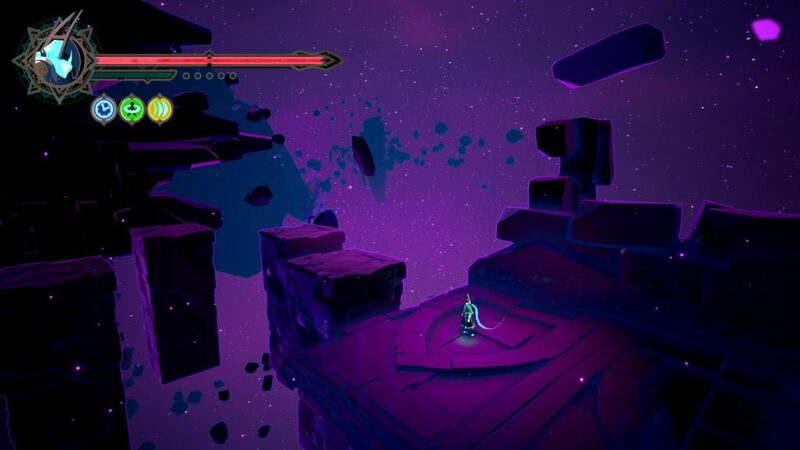 Because of the way the story plays out, you constantly run through the same areas over and over again, with very little enemy variety. It doesn’t take an incredibly long amount of game-time to get into the mindset of just rushing to the day’s end to get your next clues for the murder investigation. As if that were not enough, a disproportionate amount of the enemies are of the blocking archetype. This means you are forced to use a lot of heavy attacks, which are slow and have lower DPS. All this while you’re just trying to get to that next clue. Omensight nails everything in terms of presentation and “packaging” of the game, but struggles with a few core gameplay issues. All in all, it’s only a few steps away from being up there with the greats of the genre such as Bastion and Transistor, and that’s not a bad place to be at all! Heartily recommended for all fans of the genre.